Well it has been a busy week, and I have not been able to spend as much time on productive sewing as I would have liked. You see I have a new toy that has taken away much of my focus. It is a good toy and a great distraction. I have waited quite a long time to take this home as it is not cheap. I also did not realize how difficult it is to transition from one sewing to machine to another. But it is a process I am willing to endure! Once I am more familiar with the ins and outs of this machine, I will be sure to post a full review on the Bernina Aurora 440QE. (Just as a side note, I managed to snap a needle with the new Bernina in the first half hour of playing with it, just as I wrecked the needle threader of my Janome when I first got that machine!). I have made some time to piece together the Jaffa Cake fabrics selected earlier in the week using some lime green linen/cotton blend fabric as sashing, and I am busy quilting it this weekend. I am using the Janome though, as I am not confident enough yet to use the Bernina for straight line quilting. I hope you all have a great weekend. Rain has been forecast for our weekend in Melbourne, it is much needed but not exactly forthcoming. Please do a little rain dance for us so that these clouds don't just pass us by! Congrats on the new toy...looking forward to your review. I hope you adore yours as much as I do mine. It's a great machine. I enjoy stopping by your blog to see your beautiful quilts. You really have an eye for putting fabric together and I'm in awe of how much you accomplish! Very inspiring. Oh wow...machine envy! You lucky duck....I'm so in love with my Bernina...I hope you love yours just as much! They are truly the best quilting machine known to woman. You will love it, I have had mine a few years and it is my right arm. Congrats on the new sewing machine. Lovely! Ohhhh exciting stuff Rita! Can't wait to see it up and running. Loving the colours in this new quilt ... as usual you do not disappoint! 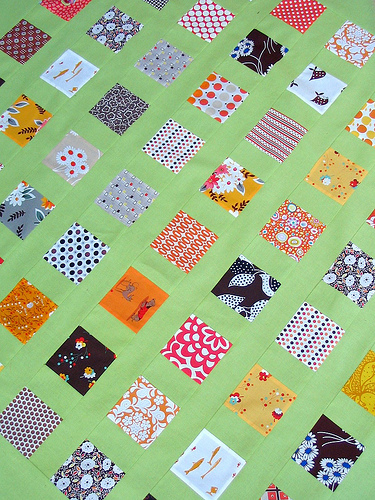 Funny that you aren't confident on straight line quilting, that should be the safest. Lucky lucky thing! I know what you mean about two machines...you get used to the littlest of details such as which way to lift the foot up lever! Have fun with it. We have rain in Adelaide today and as much as I hate using my dryer, the rain is very welcome. Congratulations! I can't even begin to imagine the amazing work you will create with your new machine. I look forward to the review! love the green sashing on the quilt...have fun experimenting with your new toy..lets hope the needle is all you break! Oh you lucky girl Rita! HAve fun exploring your new machine!! I'm sure you'll love your new Bernina. I have the same model and I think it's fantastic. Yippee for you!! Have lots of fun with your new toy! You will love it!!! Congratulations to you! You're going to love this machine! I just got a 430 about a month ago. It has made such a difference in my quilting! Well, actually, now I CAN quilt! Before I just made quilt tops and tried to quilt them and ripped out the quilting. I can't believe the difference a high quality machine makes. The Bernina 440QE is my dream machine, something I am working towards. congrats on the new toy and the Jaffa quilt is looking really great! Oooh that's my new machine too! I love it although I haven't used it a great deal yet. What I have done looks great though and it's so easy to use. Have fun using it! Enjoy your lovely new machine, you will love it. At least you only broke a needle. Only one?! Enjoy your new machine, but be prepared for a period of transition; it is taking me a while, and I didn't even change brands! Congrats on your new machine! I am sure you will love it!! I have to ask, you use a lot of linen and cotton/linen blends. Where do you find them? By the way, we are getting lots of rain here this weekend due to tropical storm Danny. I would love to send some your way. Hope you get enough rain! Congratulations! I hope you love yours as much as I love mine. It really is an adjustment moving from one machine to another, but after a while, you'll be totally smitten with it! You'll definitely have to let us know if it is worth the price. My main drawback (besides the price) to plopping down so much cash is that the sewing space (to the right of the needle) looks rather small. 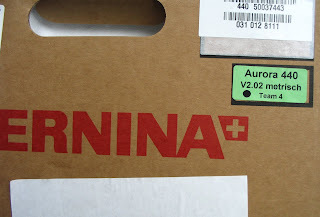 i'm also an inconditional fan of bernina aurora 440qe. i love mine, it's my first machine though and i'm still exploring (i've also broke a needle so far). it's so expensive that i'm afraid to break something else!!! to me, you are already such a wonderful artist, now that you have the best machine in the world i can't even imagine what will happen. what a team you'll make!!! have fun and keep sharing with us your experiences. thank you for that by the way... you're an inspiration!!! Enjoy! I moved from a Janome to the Aurora about 5 months ago and I am lovin it, especially the BSR and top bobin winder. congrats on the new toy... and nice selection with the green.. very different! I love my 440QE too! Mind you, I've never broken so many needles - got to remember to change that patchwork foot before doing any other fancy stitches. The BSR is fab too. And the hand-quilting stitch is good as well. Congratulations for your Bernina, Rita! I have the Aurora 430 and I must say I LOVE it!!! Rita, with that machine you are going to blow us all out of the water with your creations. Congrats on your new toy! I just got a 430 this past may and my husband has been calling it my second husband! You will LOVE it!